You don’t need to travel to enjoy the classic taste of tiramisu – all you need is my homemade ice cream recipe! One of my all time favorite desserts is Italian Tiramisu! This traditional dessert is made by soaking crunchy, Italian cookies called ladyfingers in coffee liqueur then adding layers of sweetened mascarpone cheese and cocoa powder. While Tiramisu is lovely as-is, I believe every dessert can be transformed into something magical – thus, my Tiramisu Ice Cream was born! Have you tried my Two Ingredient, Homemade Ice Cream recipe? You simply whip up a high-fat, fresh dairy cream and condensed milk to create this amazing ice cream base – no ice cream machine required. You know that saying, “If it sounds too good to be true then it probably is…?” Well, in this case, it’s true. This ice cream tastes just as rich and creamy as your storebought favorites. I have made almost 100 flavors from this two-ingredient base including Lemon Meringue Pie, Mint Chocolate Chip and even my favorite flavors of Ben & Jerry’s Ice Cream. Check out my Freezer Section Ice Cream Destination for all of my homemade ice cream recipes. In Italian, Tiramisu actually means pick-me-up which refers to the yummy strong coffee that flavors this layered desert. Well, my version has the same punch as it starts with my coffee ice cream as the base. Next, I fold in crushed ladyfingers because you can’t have tiramisu without, then finish with shaved dark chocolate. 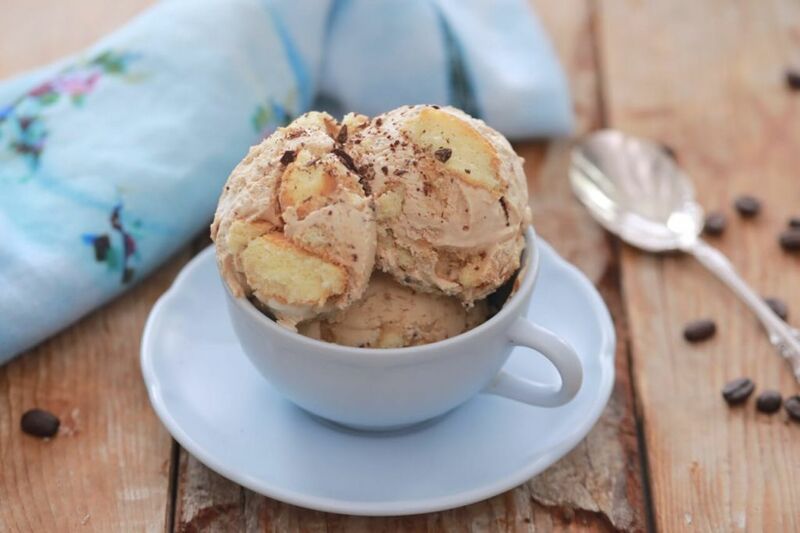 This Tiramisu Ice Cream is as rich and complex as the real thing without all the fuss! Honestly, what could be more satisfying? ENJOY MORE ICE CREAM FLAVORS! In a small bowl dissolve your instant expresso powder in water, set aside. Now you have your ice cream base add in your coffee mixture and mix on medium speed until even in color. Lastly, fold in the crushed lady fingers and chocolate. hi, Gemma. Does that taste like Gelato? If i were to keep that in a display chiller, how long can it last? These recipes are designed for the home cook. Food for sale and supply has all sorts of regulations where I am. I cannot advise you on this matter, it is dependent on where you live, the quality of your storage, reliability of your display temperatures etc. Hi, Gemma. I LOVE your recipes! I have used your 2 ingredient recipe for ice cream, and have come up with a number of flavors that are wonderful! However, while most of my flavors have a great consistency, a few of them have hardened a lot. One is peanut butter with chocolate- I add the pb to the whipped base, & about 2 hours later, I add chopped pb cups swirls of chocolate syrup. At the 2 hour time the base is already solid enough to scoop. After 6 hours total, it needs to sit out for 20-30 minutes before it can be scooped. The same with adding berries that have been cooked down w/sugar- it also gets too hard when. All of my flavors taste amazing- can you help with the consistency issue w/some? Thanks! this is a great question. The answer is simple! This recipe is based on two ingredients, condensed milk, which is an invert sugar, low in water, remaining soft when frozen. Fresh heavy dairy cream, at 35% or more fat content, low in water content so it freezes relatively soft. Add water to this, in the form of fruit juices/syrups etc and it will freeze harder, though I am a bit confused by the peanut butter one, as it too is high in fat and should freeze softly. This is what I can think of, you may know a bit more about it. I did not find anything in your description which sounded wrong. Ever since I found your YouTube channel , I have been obsessed with your recipes. I am trying to watch all you videos and made a couple flavors of ice creams. I made vanilla, cookies and cream, and mint chocolate. All of them came out great, I have also attempted to make peppermint bark ice-cream and it came out good but I would like your help to perfect it. So with the peppermint bark, I melted white chocolate and added it to the ice-cream base. I also ground/chopped candy cane and chocolate and added it mixture. It came out good but I would like to perfect it because this is my husband and nephew favorite ice-cream. Hagen daz use to make it seasonally but I think they stopped because I haven’t able to find it over the past couple of years. Anyhoo any suggestion would be appreciated. Mimi, you are a Bold Baker indeed! I have not worked this! I am not sure about the white chocolate in this. White chocolate tends to be quite sweet and I think it would be lost in this. I think a grated dark chocolate, about 70% cocoa solids would be lovely in this. A cup or so of crushed candy canes, and a 1/2 teaspoon or so of peppermint essence/extract would elevate it. I will try this too, I am thinking we would all love these perfect flavors. Did you ommit the mascarpone on purpose in this ice cream recipe? I’m so glad to hear that. Yes, the ice cream is so rich on its own I thought it didn’t need the mascarpone. Enjoy! For some reason, I cannot use the ‘reply’ option after your comment so I am afraid I have to write a fresh comment here. I followed the instructions strictly so the coffee was not boiling hot but it was definitely quite warm when I added it to the mixture. Do you think it could have been the reason for the curdling? Yes! I do think that is the reason. All things being equal, the ingredients being right I think the hot coffee could cause an issue for you. If you use a fine instant coffee powder, such as an instant espresso powder, you can add it directly to the mix without dissolving in water. It will incorporate easily into the mix for you. I hope this is of help to you. Thanks for your recipe. I do not have a stand or hand mixer so I did the whipping the old fashioned way. Everything seemed fine until I added the coffee, after which the mixture started to appear separated. It seems a little curdled now. The cream was definitely not over whipped so that couldn’t be the reason. Could you please tell me where I might have gone wrong? I have just chucked it in the freezer and I am still hoping it wouldn’t be a complete disaster because I had been waiting for weeks to make this! Hello! Was the coffee hot or cold when you added it to the mixture? yes they are the same thing. you can use both to make ice cream. saw the microwave cake recipe on fb and came to your page….saw Ice-cream no machine videos…all of them. Did Tiramisu and o I am in heaven. Made it twice in 3 days and we love it so so much. Mille grazie from a Tiramisulover. Hi there, or should I say Ciao! Sono felice di avere questo grande scherzo italiano per lavorare. I did it again…..and came across something I wonder….I bought a can of sweet condensed milk and it says 14 oz / 396 gramm … but that is only 300 ml!!! Checked all sweet condensed milk cans at the store, but no 400ml. Grüße an Sie in Deutschland. 14oz is 400ml! ML and grams are the same for liquid ingredients. Hi there, thank so much for letting me know! Please show me the perfect way to bake and grill a fish. the marination, right temperature,time. It never turns out perfect ?. And with fish if you can show us chicken too that will be great. I make tandoori chicken often. Tried your home made no machine ice cream , it turned out awesome! Thanks …?? We all love grilled food, so tasty. This is not my specialty here on BBB, but I will be getting to it at some point. Grilling fish is all about timing, most fish cooks really quickly, and allowing it to stand for a few minutes, covered, after it is cooked helps to distribute the heat to finish the cooking. Bone in foods are great for the grill too as the bone helps to conduct the heat, and adds flavor. Marinades are a skill, and there are lots of suggestions online, for all sorts of foods. Take a little time to check some out, it is so worth it! Gemma, I tasted Horchata ice cream this week, I would love to see if you can create a version of it using your ice cream method. My son and I have made strawberry swirl with graham crackers and banana nutella swirl. Last week we made strawberry popcicles. Thank you. Thank you for being with us. I am happy that you and your son are using the recipes. Horchata is a most unusual ice cream, made with rice starch and almond milk, to make it sound simple. It is a complex process, and I will need to think about how to use it. It is a delicious thing, you were lucky to find it! How much lychee fruit puree and lychee chunks should i add in icecream base to get lychee icecream? sure, that will work. Blend it up really well. Your 3 ingredient ice cream recipe is simply fabulous! My family loves it. Thank you! They recently gifted me with a Kitchen Aid( so I could make lots and lots of it). Thrilled to have the wonderful machine. I guess I owe another thanks to you?. I’m so delighted to hear that you like the ice cream. I remember when I got my kitchenmaid. I couldn’t stop looking at it. I had a hard time finding the recipe for the ice cream base. The only place I could find it was in the tiramisu ice cream recipe. Due to surgery I won’t be able to eat solid food for a few months. I have been printing out recipes & figuring out what I want to try first. You have so many choices. Poor you, surgery is never fun! All of the ice cream recipes can be found here (https://www.biggerbolderbaking.com/homemade-ice-cream-no-machine/). I tried your Tiramisu Ice Cream and my husband loves this ice cream better than any Dessert I’ve Ever made before! (and I rock in the kitchen!!) Obviously, you Rock the Kitchen Harder!!!? I did adapt the recipe to fix my family’s taste. I added 3 tubes of Instant Cafe Bustelo powder instead of only one and I didn’t dissolve it in water but instead just dumped it into the cream while whipping. I used 60% cocoa chips chopped roughly in the food processer. The first time I made this my local store was out of Lady fingers so I used Vienna Fingers, lol. Maybe using the Oreo cookie idea would taste better? Maybe I did something wrong? Thank you so much for the Ice Cream Base Recipe!!!!! Lady fingers do tend to go soft. next time maybe a plain cookie like a graham cracker. I’ve just discovered your channel on YouTube and it was AWESOME. I want you make a galaxy mint ice cream. I have never heard of galaxy mint ice cream. I will definitely have to check it out. Since on 15th May I left a comment on this page, I thought of the recipe 4 galaxy mint ice cream. U can find it on facebook this Sunday. I remember the suggestion. Thanks for your comment. Hello from India,loved your icecream recipe. It came out divine! Made Oreo, chocolate, tiramisu. I made a great banana icecream too..going to try a roasted almonds and honey icecream next.. Wonderful recipe as always. Was wondering if I could substitute the instant espresso powder for instant coffee powder.